(Trent Nelson | Tribune file photo) Karrie Galloway, Planned Parenthood Association of Utah, at a news conference on Utah's pending 18-week abortion ban, at the Utah Capitol in Salt Lake City on Wednesday April 10, 2019. Earlier this year, a new Trump administration rule asked Utah’s Planned Parenthood to choose between ending abortion referrals and potentially forgoing $2 million in federal funding for reproductive care. Planned Parenthood groups in Utah and other states say they will give up the money rather than submit to what they call a “gag rule” designed to silence them on abortions. 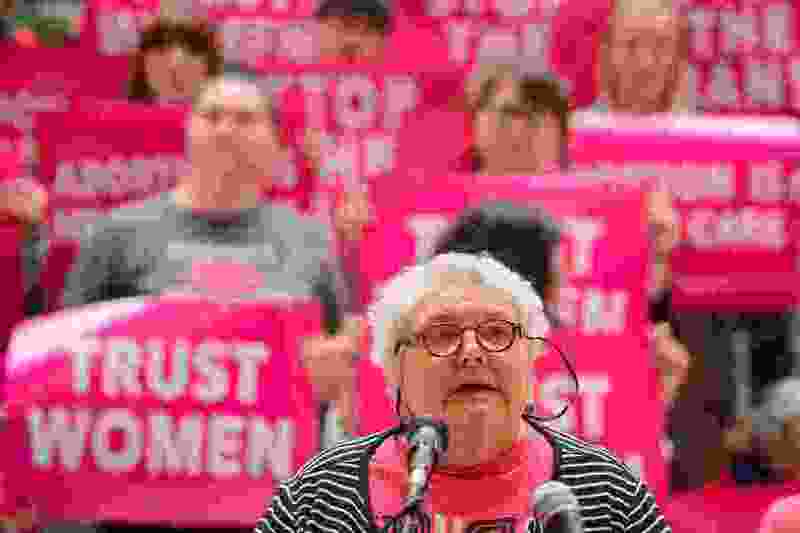 But they say the loss of funding could stretch them thin as they try to provide free and low-cost birth control, wellness checks and cervical and breast cancer screenings to Utahns. “My blood pressure is just rising, to be honest with you, thinking about how they [Trump administration officials] have ... bastardized such an effective, ethical program for their own purposes,” said Karrie Galloway, president of the Planned Parenthood Association of Utah. The rule unveiled in February by the Department of Health and Human Services seeks to attach additional conditions to Title X funding for family planning. In essence, it requires new firewalls between government funded services and groups that provide abortions or referrals for abortions. While Planned Parenthood says no taxpayer money goes toward abortions, its providers do discuss abortions with patients and sometimes refer them for the procedure, a practice that would now be prohibited for Title X grant recipients. The group says it cannot in good conscience accept the funds with these strings attached. They are hoping the new rule is overturned before they’re forced to give up the money. Multiple states and medical and reproductive rights groups have challenged the Title X change in federal court and asked for an injunction to halt it from taking effect in early May. The Planned Parenthood Association of Utah (PPAU) uses Title X funds to care for 36,000 Utahns each year, providing birth control and other preventative care, and it has been the state’s lone recipient of these federal grants since the 1980s. The federal funding — which was to total $2 million for the coming year — represents about a fifth of the PPAU budget, the organization says. Mary Taylor, president of Pro-Life Utah, said she’d rather the federal money go to health clinics that perform a broader range of medical services. "I think Planned Parenthood only has very limited reproductive health services. If you're going to carry a child to term, Planned Parenthood is not going to help you," she said. "I think that our resources are much better spent somewhere else." But a group that represents Utah’s health centers says these clinics already strain to meet the needs of their current patient population. Alan Pruhs, executive director of Association for Utah Community Health, says his network encompasses 13 community health organizations that run 55 clinics across the state, serving about 160,000 patients a year. The focus is on primary preventative care, Pruhs said, so filling the shoes of Planned Parenthood would require significant adjustment. "It's definitely slightly outside of our wheelhouse, so to say," Pruhs said. Even if the association’s member groups were able to land Title X grants, they would have to provide training for clinicians on reproductive health care to make sure they’re comfortable offering the services Planned Parenthood provides. In many states, public health departments receive and distribute federal family planning funds. But that hasn’t been possible in Utah so far because of a law requiring state health departments to secure parental consent before providing reproductive health services to minors. That provision conflicts with a Title X mandate that grant recipients must offer services to any and all residents who seek them. Hoping that the federal government might make an exception, the state health department applied for the federal grants last year and was turned down, according to Tom Hudachko, the agency’s spokesman. Gayle Ruzicka, president of the Utah Eagle Forum, says she's confident the Trump administration will relax the Title X restrictions so the Utah health department could accept the funds. Once that wrinkle is ironed out, Ruzicka says, the rule change to redirect federal grants will be a net positive for Utah. Galloway says PPAU maintains a “bright line” between taxpayer funding and abortion services — the group’s abortion clinic occupies its own building, and the association is audited annually to ensure there is no budgetary crossover. This isn’t the first battle Planned Parenthood has fought with the Trump administration. The Utah association last year joined two other Planned Parenthood groups in filing a lawsuit to challenge Title X program changes that placed an emphasis on natural family planning over birth control. Galloway said that lawsuit is still pending.